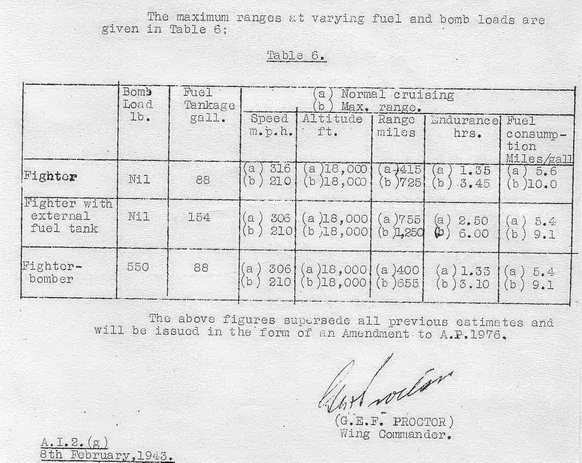 SUMMARY: Dimensions and weights of Me 109G1 and 2.
boost and r.p.m., calculated maximum speed 395 m.p.h. Mean wing chord 5.7 ft.
Total flap area 11.2 sq.ft. Total slot area 6.7 sq.ft. Total radiator flap area 8.6 sq.ft. Total area of ailerons 8.3 sq.ft. Span of the tail unit 9.8 ft.
Tyre size: 650 x 150 (Conti, Metzeler, Dunlop). Pressure in oleo-leg (no load): 355 lb./sq.in. Leg with helical spring and hydraulic damping. Tyre size: 290 x 110. Three-blade propeller, type VDM 9-12087 A.
rating of the fuel used is 87.
operate in excess of the "climb and combat" ratings 2 and 5.
i.e. say 15,000 ft. instead of 18,700 ft. (rating 4.). The oil consumption is given as .009 to .016 lb./hp/hr. The weight of the engine, dry, is 1,540 lb. +3%. One oil cooler is fitted, type SKF/Behr FO 820.
and weight 60 lbs. The test pressure is given as 71 lb./sq.in. Two light metal radiators, type SKF/Behr. Al.F.750 B. The coolant used is a mixture of water and glycol. and the weight is 131 lb. The test pressure is 28.4 lb./sq.in. capacity is 1.1 gal. of coolant and 1.1 gal. air space. the test pressure is given as 7 lb./sq.in. gallons with an additional air space of 1.3 gallons. Weight 12.75 lb. Test pressure 5 lb/sq.in. 88 gallons; weight 121 lb. ; test pressure 2.8 lb./sq.in. Max. flying weight 7,606 lb. the other hand, the fighter-bomber conditions with 96 x 2 kg. Me 109 G-2 can carry 96 anti-personnel bombs. brought down at Worth Maltavers on 9/6/41. hole and score mark in one airscrew blade........"
particularly at high r.p.m., runs sweetly ......."
accurate speed with reasonable care." and so the engine should be opened up slowly when "rumbling"
controlled and they open as the engine temperature rises. They are big enough to cause considerable drag when wide open. and so decrease the performance............."
been somewhat reduced by this......."
boost constant below rated height, and it decreases above. height at governed r.p.m. (2750)." gave 262 m.p.h. indicated, equal to 378 m.p.h. computed." was locked open as mentionedin the extracts given above. Tropical version fitted with an air-cleaner. Data given below under te heading "Performance"
Fighter with external jettisonable fuel tank: 7,230 lb. Fighter: 395 m.p.h. at 22,000 ft., and 328 m.p.h. 367 m.p.h. at 22,000 ft. and 305 m.p.h. at sea level. 22,000 ft., and 305 m.p.h. at sea level. Fighter: at start 37,500 ft, at finish 39,000 ft.
start 35,000 ft., at finish 39,000 ft.
35,000 ft., at finish 39,000 ft. Fighter with external jettisonable tank: 6.3 min. Fighter-Bomber with 550 lb. of bombs: 6.3 min. will be issued in the form of an Amendment to A.P. 1976. Last updated 12 August 2006.